Welcome back to our blog page here at J&J Metro Moving & Storage! We have been proudly serving the Orlando area for over 50 years and we absolutely love what we do. Being the first call that people make when they need commercial movers, residential movers, packers, storage, and supplies is something that is very important to us. We take pride in doing our job well and leaving a trail of extremely satisfied customers in our wake. Have a big move coming up? Contact us today to schedule services! Growth in your company or business can be an extremely exciting thing. It can mean more productivity, more customers, more employees, and ultimately, more equity for your business. Growth is essential for any healthy business or organization and it can be really exciting to start outgrowing the facilities and products that used to be ideal. However, as great as growth can be, it can often mean that your current facility is no longer suitable for your growing business. When you reach this point, it becomes necessary to consider relocation. 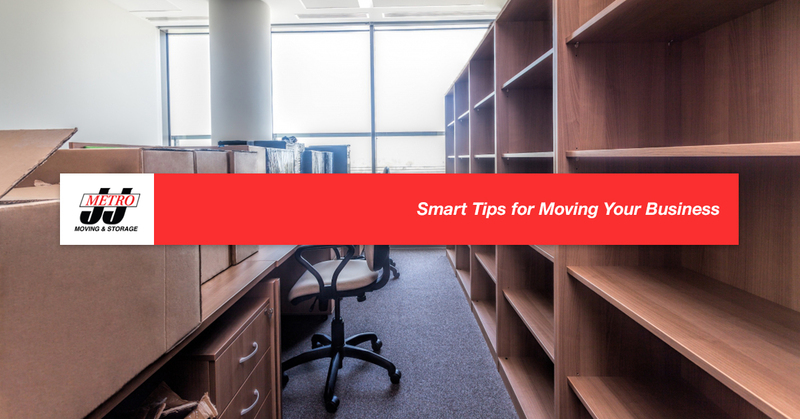 Moving your business may seem like an intimidating ordeal, but it can be done quite quickly and successfully if you know how to go about it. In today’s blog, we’re going to look at some of the best tricks to efficiently pull off your big commercial move. Moving your business to a different location can often be accompanied by an upgrade or update in some office equipment. What better opportunity could there be to be out with the old and in with the new in your workspace? If you’re getting rid of old computers, desks, chairs, shelves, or anything similar, consider donating them to a worthy cause. Locate a thrift store that gives proceeds to a good cause or find a recycled electronics organization. Besides making a difference to someone less fortunate, the best thing about donating your old equipment? Your donation will absolutely come with a potentially sizeable tax deduction for your business. Hiring commercial movers is one of the best decisions that you can make, especially when you’re looking at a big office move. Your moving team can do as much or as little as you like, although, we recommend you let them expertly pack your office up and safely transport it to your new location. When you give your business moving team a call, make sure that you contact them at least a month in advance. Since large commercial moves can often take up a good amount of the moving company’s manpower and resources, your movers will definitely need to be able to plan in advance for your relocation. Don’t wait to give your Orlando commercial movers a call; make sure that your company move can take place on the exact day and time that you’re wanting. Though many people who plan a commercial move hire packers to come in and tackle the move from start to finish, there are some people who prefer to do their own packing. If you’re among this group, make sure that you pack smart. Make sure that you’ve got the right size, shape, and kind of boxes and supplies. Damaging expensive equipment with a sloppy move could mean trouble for your business so make sure that you take precautions when you’re packing. And when your boxes are packed and secured, make sure that you label them, number them, and maybe even color-code them to ensure that everything goes to the right place upon arrival at your new building. In addition to making sure that everything is packed well and securely, you’ll definitely want to make sure that every cord can be accounted for once everything is unpacked and set back up. A great and effective way to make sure no cords get lost is by putting every cord into a plastic bag and labeling it with the name or number of the computer that it accompanies. Packing for your big move doesn’t have to stress you out, as long as you make sure that you take some important steps. A move can be a tricky thing for any business to navigate and there certainly are a lot of things to think about. One of those important details is to make sure that the public is aware of your new location and there are several great and effective ways to go about doing this. Having current details can be extremely vital to ensure that there’s no interruption in your business. First of all, make sure that your old business has decals and signs that indicate your move and make sure that your new address is included. Also, ensure that your website information is updated so that customers who are trying to find you don’t accidentally go to your old address. This can cause frustration and even a loss of business. Finally, try and make a list of everywhere that your business details might be advertised. Though it can be tedious, make an effort to update your address in each of these places. Making sure that all of your business details are current can be instrumental in the transition and steady flow of your business. Commercial moving can be quite a feat, but it doesn’t have to rob you of your peace of mind. Just remember these tips and make sure that you have a solid plan of action for when moving day finally arrives. There is nothing like being able to get all of your employees set up in your new location and there’s no greater feeling than that of a successful move. If you’re looking at the logistics of your big commercial move, contact us at J&J Moving & Storage! We handle commercial moves, residential moves, packing, storage, and so much more! With 50 years of experience serving the Orlando area, we are the best call that you can make. Contact us today or visit our website for a free quote!